It’s the end of 2014, and I’ve fallen behind on the blog (again) because of taking some teacher certification tests. Unfortunately, I didn’t get around to everything I planned to do this year, though there are some exciting things I did get done as well as things that will be going on. Designing and writing a game in a short timeline can be daunting, but with proper organization and a solid effort it is far from unachievable. The key to making a game in a very short time is to do a little bit of preparation and outlining ahead of time; an hour or two of prep makes the rest of the design and writing go by very quickly. 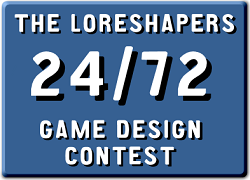 Loreshapers is my new pet project, and I’m starting things off big—two contests for game design! Read below the break for more details.